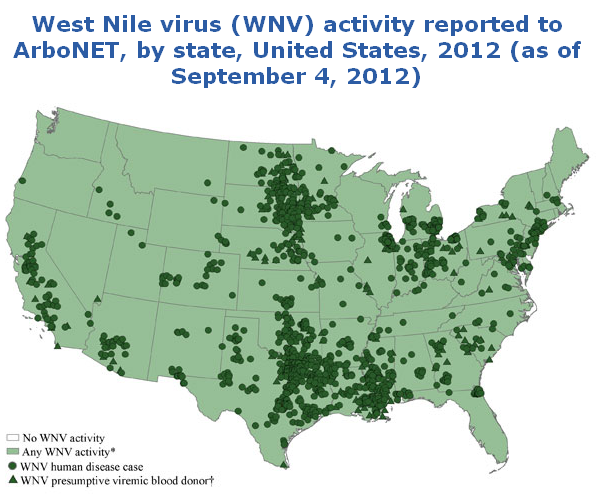 WNV cases have climbed by 71 percent and the deaths by 89 percent since August 21, 2012. WNV cases include 54% neuroinvasive disease cases and 46% nonneuroinvasive disease cases. Three hundred and thirty five WNV presumptive viremic blood donors (PVDs) have been reported as of September 4, 2012, CDC said. About 71 percent of the cases this year have been reported in six states: Texas (45%), South Dakota (6%), Oklahoma (6%), Mississippi (6%), Michigan (5%) and Louisiana (4%). At least 87 people have died from WNV infection in the U.S. so far this year. The 2,280 reported WNV cases include 1,069 (54%) neuroinvasive disease cases and 924 (46%) nonneuroinvasive disease cases. Three hundred and thirty five WNV presumptive viremic blood donors (PVDs) have been reported as of September 4, 2012, CDC said. Two thousand two hundred eighty (2,280) human West Nile virus infections have been reported to CDC ArboNET from Alabama, Arizona, Arkansas, California, Colorado, Connecticut, Delaware, District of Columbia, Florida, Georgia, Idaho, Illinois, Indiana, Iowa, Kansas, Kentucky, Louisiana, Maryland, Massachusetts, Michigan, Minnesota, Mississippi, Missouri, Montana, Nebraska, Nevada, New Hampshire, New Jersey, New Mexico, New York, North Carolina, North Dakota, Ohio, Oklahoma, Oregon, Pennsylvania, South Carolina, South Dakota, Tennessee, Texas, Utah, Virginia, West Virginia, Wisconsin, and Wyoming. Alabama, Arizona, Arkansas, California, Colorado, Connecticut, Delaware, Florida, Georgia, Idaho, Illinois, Indiana, Iowa, Kansas, Kentucky, Louisiana, Maine, Maryland, Massachusetts, Michigan, Minnesota, Mississippi, Missouri, Montana, Nebraska, Nevada, New Hampshire, New Jersey, New Mexico, New York, North Dakota, Ohio, Oklahoma, Oregon, Pennsylvania, Rhode Island, South Carolina, South Dakota, Tennessee, Texas, Utah, Vermont, Virginia, Washington, West Virginia, Wisconsin and Wyoming. Further explanation of WN meningitis and/or encephalitis. This entry was posted on September 6, 2012 at 8:01 am	and is filed under Global Disaster watch, global disasters, global disasters 2012, global health catastrophe, global heating. Tagged: acute flaccid paralysis, carrying capacity, encephalitis, neuroinvasive, PVDs, West Nile, West Nile encephalitis, West Nile infection, West Nile meningitis, West Nile meningoencephalitis, West Nile outbreak, West Nile virus, WN meningitis, WNV. You can follow any responses to this entry through the RSS 2.0 feed. You can leave a response, or trackback from your own site.